I needed to move three ponies to the horse trailer. I haltered all three and chose one to just throw the lead rope over her back. I led the other two. The third stayed with us, between the two other ponies, all the way to our destination. I had assumed she would do just that since she was accustomed to following the lead mare. I used that alliance to accomplish my goal. Many years ago I was discussing ‘natural horsemanship’ with a trainer. We agreed that it was the only way I’d be able to achieve what I wanted to achieve with the herd size that I had. By partnering with my mares especially, I would be able to accomplish more training than a single person would normally be able to do. I use the alliances in my herd for many things, including teaching foals to trailer load, accustoming a pony to voice commands, and shifting a herd from one pasture to another. In the case of the three ponies at pasture needing to go to the trailer, I used the alliances amongst them to move three ponies by only leading two. I also use alliances when I ‘take attendance’ at feeding time. When there is one pony instead of two in a group greeting me at the fence, or two instead of three, I know some investigation is in order. Because of alliances, I’m less worried when a single pony misses roll call than I am when it is more than one. Rarely have I had a single pony go very far on its own when it breaches a fence. Only occasionally will a mare with foal at foot go far. Two older ponies, though, that’s a different matter! At the moment, I have two impressionable ponies, the two newest to my herd. I am particularly pleased with the alliances they have chosen. They are each enjoying the company of my two oldest ponies who are my working ponies and are tremendous partners for me. I like very much that my impressionable ones are absorbing habits and manners from veteran workers. The photograph shows my stud colt Restar Lucky Joe and Torrin, my Norwegian Fjord Horse gelding. I’ve done lots of ponying with Torrin and Joe, taking advantage of this alliance. I’ve also had Joe watch Torrin working in harness. Willowtrail Spring Maiden is my other new pony, and she has bonded with Mya the Wonder Pony. I haven’t figured out how to take advantage of this alliance yet, but it’s on my mind every day as I see them together. There are, of course, cases when alliances are not helpful. 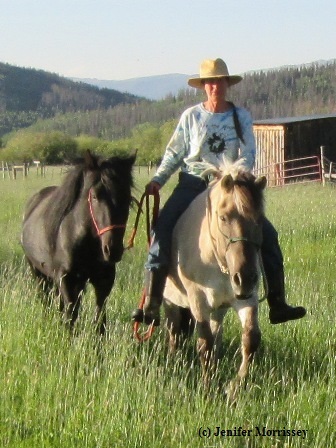 I heard from a client who had begun having trouble catching a pony they’d purchased from me. I never had problems haltering that pony, but since being in its new home, it’s been sharing a paddock with a pony that is notoriously difficult to catch. Because the Willowtrail pony is young, it is impressionable and apparently is taking an unwanted cue from its older paddock-mate. Alliances can be useful, and they can be otherwise. I am careful in my herd to manage any possible unhelpful ones as much as I can. While I said I was happy with the choices that my impressionable ponies had made regarding alliances, it’s a little inaccurate to say they ‘chose.’ I had a hand in their choice; my happiness is that my choices worked out so well! If yo u enjoy stories like this one, you might also enjoy the books A Humbling Experience and What an Honor, available internationally by clicking here.